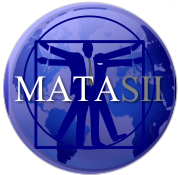 MARKET AT CRITICAL JUNCTURE & THE BUYBACK BLACKOUT WINDOW MAY BE THE TIPPING POINT! 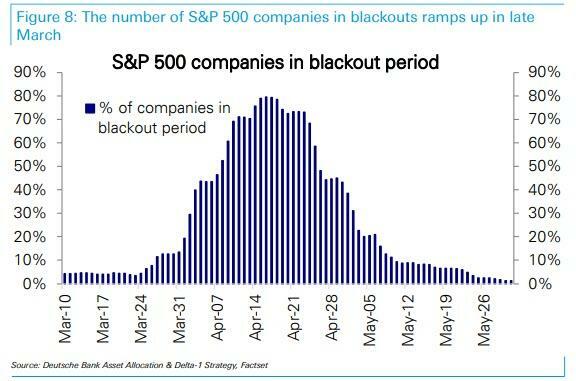 SOURCE: 03-18-19 - - "Buyback Blackout Period Begins Just As Bears Capitulate"
According to Deutsche, the number of S&P 500 companies in blackouts will ramp up sharply starting in the last week of March and peak mid-April, implying a reduced pace of buybacks. 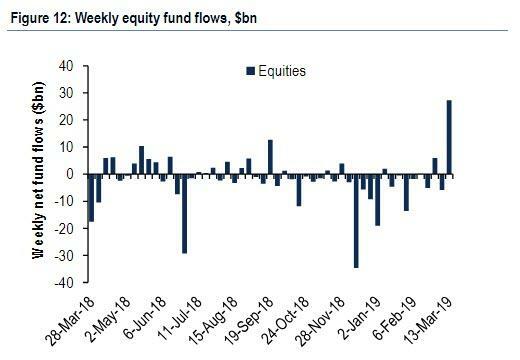 Large outflows of over $100bn since October, US equity funds this week saw inflows surge with over $31bn in the first 3 days, helping drive the S&P 500 back to the top of its recent range. A 4 month boycott, bearish investors finally threw in the towel and after pulling money from equity funds for 13 weeks, bought a whopping $27.3Bn of US stock funds and ETFs in the week ending on March 13th. 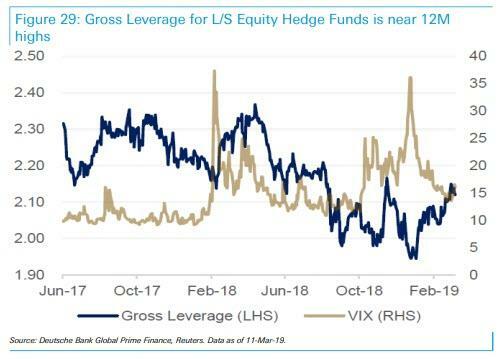 The market stormed higher so did hedge fund Gross Leverage for Equity L/S Hedge Funds, which is now near 12M highs, after managers slowly added risk YTD. Equity L/S Hedge Funds had a strong week bringing YTD returns to +6% on average. Top $-longs continue to outperform top $-shorts, although PMs trimmed net exposure slightly. This was the second largest inflow on record, behind $38.30bn from March of last year, and contrasts with a mix of small inflows and outflows earlier this year, including a $5.83bn outflow in the prior week. In a majority of episodes surging inflows were a contrarian indicator. 6 out of the 9 episodes saw the S&P 500 fall an average of -5.9% over the course of the following one month, accompanied by outflows. Exceptions were when inflows were just catching up after lagging the market. 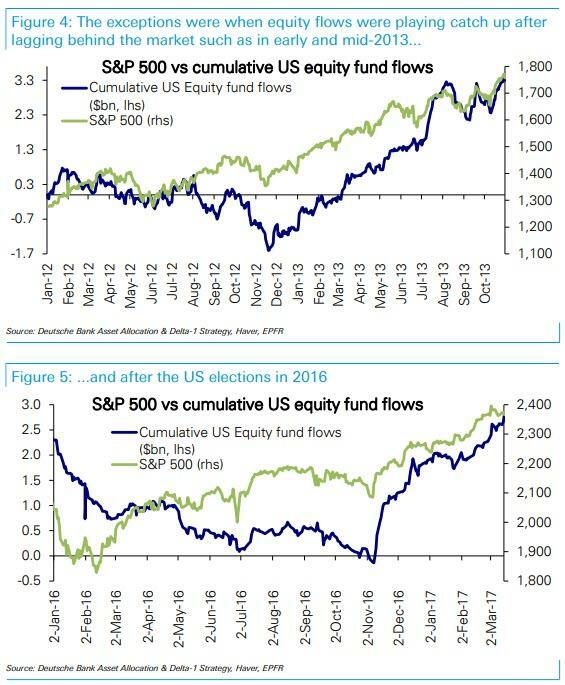 In early- and mid-2013 and in late 2016 following the US elections, strong equity inflows continued for an extended period of time after the initial surge, driving the market even higher. These exceptions are instructive in that they all occurred when inflows were playing catch up after lagging far behind a market rally, which may be the case now. The Risk from Vol Control is to the downside. Risk Parity continues to buy equities providing a tailwind. Emini (S&P futs) liquidity remains abysmal, with the average ES bid/ask contracts size just above 1,000 and toughly where it average for much of the fourth quarter. This means that any abrupt and sustained reversal will likely lead to sharp and violent drop in the market, as multiple bid levels are taking out in a rerun of what happened in December. Last week, one of the most confounding features of the post-Christmas rally was resolved, when following a 4 month boycott, bearish investors finally threw in the towel and after pulling money from equity funds for 13 weeks, bought a whopping $27.3Bn of US stock funds and ETFs in the week ending on March 13th. This was the second largest inflow on record, behind $38.30bn from March of last year, and contrasts with a mix of small inflows and outflows earlier this year, including a $5.83bn outflow in the prior week. 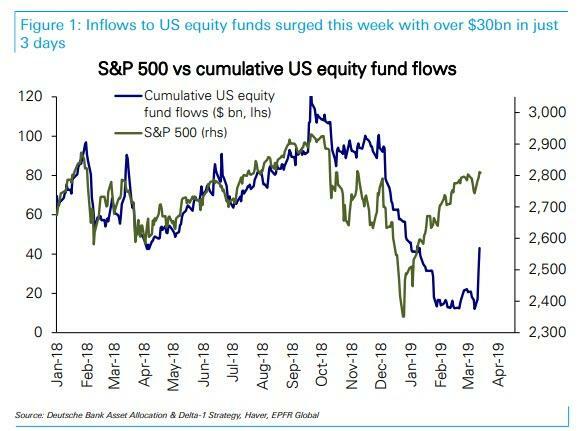 The topic of reversing equity flows was also the key focus in the latest note from DB's Parag Thatte, who writes that following large outflows of over $100bn since October, US equity funds this week saw inflows surge with over $31bn in the first 3 days, helping drive the S&P 500 back to the top of its recent range. However, arguing for the former, less cheerful take on the fund flow timing reversal is an additional downside risk that has emerged this week: according to Deutsche, the number of S&P 500 companies in blackouts will ramp up sharply starting in the last week of March and peak mid-April, implying a reduced pace of buybacks. As Thatte warns, "the outsized role played by buybacks in driving the rally in this recovery cycle as well as investor attention focused on the blackout period recently adds to the risks highlighted above." The Risk from Vol Control is to the downside. Vol Control funds were quiet this week. VIX dropped from 16 to 13.5 over the week as the market rebounded, while 1M realized vol was flat at 9. Vol Control funds are near full equity allocations, so risk is to the downside if volatility spikes. CTAs are poised to buy in the next 7-10 days if a sell-off does not materialize. CTAs are in aggregate net long S&P 500 and other equity indices, however with lighter positioning than in 2017-2018. With S&P 500's 50d MA rising and only -1.7% below the 200d MA, expect more buying if those technical triggers cross. That is likely to occur within the next 7-10 trading days if a sell-off doesn't materialize. In other words, they will buy unless they sell. Risk Parity continues to buy equities providing a tailwind. Equity allocations for Risk Parity are still low relative to their historical range. 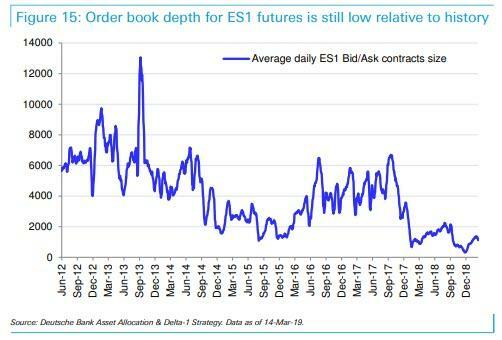 Risk Parity managers started buying equities a few weeks ago and will continue to be incremental buyers in the coming weeks as long as crossasset volatility continues to decline. Finally, as the market stormed higher so did hedge fund Gross Leverage for Equity L/S Hedge Funds, which is now near 12M highs, after managers slowly added risk YTD. Equity L/S Hedge Funds had a strong week bringing YTD returns to +6% on average. Top $-longs continue to outperform top $-shorts, although PMs trimmed net exposure slightly. One last observation: Emini (S&P futs) liquidity remains abysmal, with the average ES bid/ask contracts size just above 1,000 and toughly where it average for much of the fourth quarter. 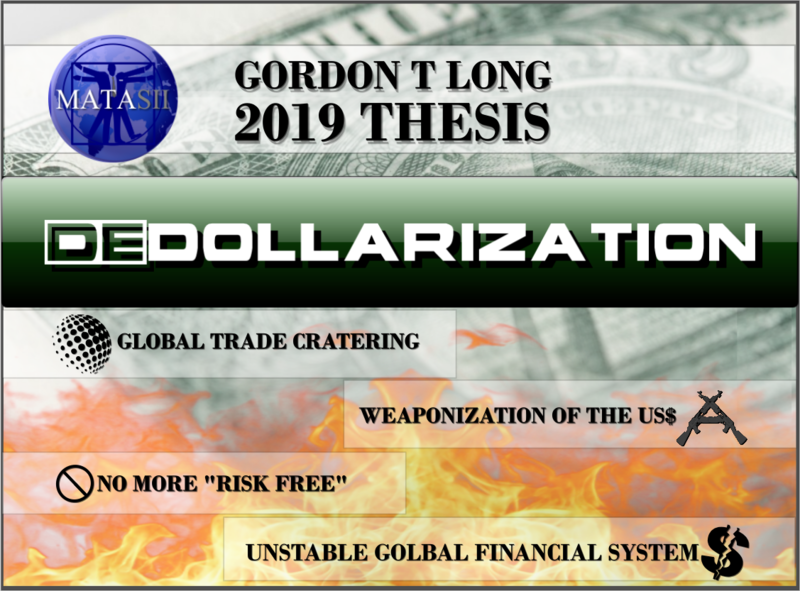 This means that any abrupt and sustained reversal will likely lead to sharp and violent drop in the market, as multiple bid levels are taking out in a rerun of what happened in December.